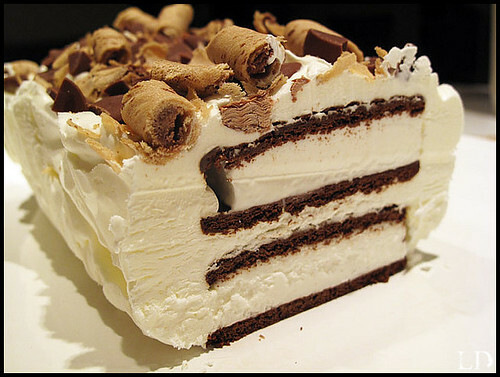 This ice cream cake can be considered cheating but the outcome is so delicious to matter! A quick solution to make kids in any household happy. The cake is so easy to make even the kids could make this themselves. Have fun with this cake and experiment with different toppings. Line a bread pan with a piece of parchment paper, allowing the paper to hang off the long sides of the pan. In a mixer beat the cream and sugar until stiff peaks form. In the bottom of the pan, arrange 3 of the sandwiches in a single layer, cutting them to fit, if necessary. Spread with half the whipped cream. Repeat with the remaining sandwiches and whipped cream. Sprinkle the top of the cake with your chocolate or candy. Cover with plastic wrap and freeze until firm. Holding both sides of the overhanging paper, lift the cake out of the pan and transfer to a plate. Discard the paper and serve. This looks so good! Going to try it with a mint flavored cookie. YUMMY! I made this dessert on Sunday. It was so easy and tasted great! Thanks!